Sugared Crescents - Let the Baking Begin! Anything made with yeast dough is good, IF the dough is good. And this dough is goooood. It’s soft. It’s sweet. It’s easy to make. And it’s awesome with evening tea. What else could one ask for? It’s been a long time since I posted anything. With finals over and my very short spring break from school, I am happy to bring you this sweet recipe. Anything made with yeast dough is good, IF the dough is good. And this dough is goooood. It’s soft. It’s sweet. It’s easy to make. And it’s awesome with evening tea. What else could one ask for? 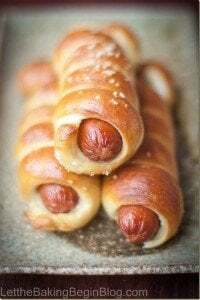 I was actually making them with stuffing, but when I ran out and didn’t feel like making another batch of stuffing, I thought of sprinkling the rolled out dough with sugar and then rolling them into crescents. As I was baking them, I didn’t really expect much. I mean, it’s just dough sprinkled with sugar. When I tried one though, I couldn’t help but remember the sweet taste of crescents they sold in our school cafeteria when I was a kid. Those were the best crescents in the world! Whenever we had a class right next to cafeteria, the sweet smell of these baking made it extremely hard to concentrate. So as soon a the class was over, we trampled each other trying to make it first out the door and be first in line to get them. The baking lady would always say, “wait until they cool down, before you eat them! !”, but of course, no one listened. You would break it open to let the steam out and bite into piece of heaven. Adding too much sugar to the dough, makes it heavy instead of fluffy. So sprinkling the dough between the layers, leaves it soft, but still keeps them soft. Besides, the sugar makes beautiful layers once you break the crescent. Dipped into some jam, or cut open and stuffed with thin slices of cold butter, these crescents are yummilicious! 1. Combine 1/2 cup milk and 1 tablespoon dry instant yeast. Stir. Leave for 5-10 minutes to rise. 2. 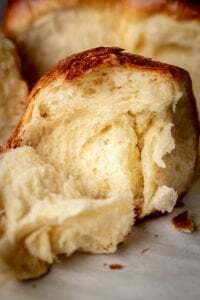 Pour 1 1/2 cups milk into the bread maker bowl or into a bowl of a mixer, add salt, sugar, eggs, butter, the risen yeast mixture, butter, vanilla extract and flour in that order. Put the bread maker into the dough cycle, allowing thedoughtobeknead and then risen. Or just put yourmixerontolow speed and let the ingredients come together. When they resemble dough, allow the mixertoknead it for 20 minutes or until the dough comes off the sides of the bowl leaving it clean. Cover with cloth and set into draft free, warm place to rise (about 1+ hour). 3. Once the dough cycle is over and the dough (if using the bread maker), or the dough is risen (if using a mixer), punch down the dough. Pour double tablespoons of oil onto your working surface and spread the oil all over with your hand. Remove the dough onto your working surface and bring all ends towards the center, to make it into a neat ball. Then put the dough ball, tucked ends down, smooth surface up, and make it into a log. Cut in 3 equal pieces. Shape each into a ball, and set it smooth side up to rest. 4. Whisk 2 eggs together. Add 1 tablespoon water and whisk again. Set aside. 5. Turn oven to 350F. Set baking rack in the middle. Line 2 baking sheets with parchment paper. 6. Roll the dough ball as thin as you can into a circle. Lightly sprinkle the dough with about 3 tablespoons sugar. Cut diagonally 5-6 times, as shown on the picture. Then roll the crescents starting with the thicker end and rolling towards the thin end. Place shaped crescents onto parchment lined baking sheet, end down, about 2-3 inches apart. Allow them to rise for about 15-30 minutes until almost double in size. Brush with egg mixture. 7. Bake crescents until golden in color. About 15-20 minutes. Allow cooling before eating. Now go ahead and make them! But even if you don’t, don’t forget to add them to your Pinterest boards, or save them to your Facebook page by sharing! Muffin Recipe – Soft muffins with olive oil, yogurt, and fresh blueberries. 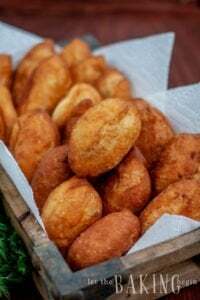 Cottage Cheese Pancake Recipe – Soft and fluffy pancakes with cottage cheese. Oatmeal Recipe – Creamy oatmeal made in a pressure cooker. Combine 1/2 cup milk and 1 tablespoon dry instant yeast. Stir. Leave for 5-10 minutes to rise. Pour 1 1/2 cups milk into the bread maker bowl or into a bowl of a mixer, add salt, sugar, eggs, butter, the risen yeast mixture, butter, vanilla extract and flour in that order. Put the bread maker into the dough cycle, allowing the dough to be knead and then risen. Or just put your mixer onto low speed and let the ingredients come together. When they resemble dough, allow the mixer to knead it for 20 minutes or until the dough comes off the sides of the bowl leaving it clean. Cover with cloth and set into draft free, warm place to rise (about 1+ hour). Once the dough cycle is over and the dough (if using the bread maker), or the dough is risen (if using a mixer), punch down the dough. Pour double tablespoons of oil onto your working surface and spread the oil all over with your hand. Remove the dough onto your working surface and bring all ends towards the center, to make it into a neat ball. Then put the dough ball, tucked ends down, smooth surface up, and make it into a log. Cut in 3 equal pieces. Shape each into a ball, and set it smooth side up to rest. Whisk 2 eggs together. Add 1 tablespoon water and whisk again. Set aside. Turn oven to 350F. Set baking rack in the middle. Line 2 baking sheets with parchment paper. Roll the dough ball as thin as you can into a circle. Lightly sprinkle the dough with about 3 tablespoons sugar. Cut diagonally 5-6 times, as shown on the picture. Then roll the crescents starting with the thicker end and rolling towards the thin end. Place shaped crescents onto parchment lined baking sheet, end down, about 2-3 inches apart. Allow them to rise for about 15-30 minutes until almost double in size. Brush with egg mixture. Bake crescents until golden in color. About 15-20 minutes. Allow to cool before eating. 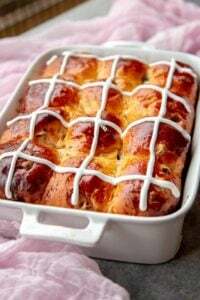 Pour 1 1/2 cups milk into the bread maker bowl or into a bowl of a mixer, add salt, sugar, eggs, butter, the risen yeast mixture, vanilla extract and flour in that order. Put the bread maker into the dough cycle allowing the dough to be knead and then risen. Alternatively, put your mixer onto low speed and let the ingredients come together. When the mixture resembles the dough, allow the mixer to knead it for 20 minutes or until the dough comes off the sides of the bowl leaving it clean. Cover the bowl with a clean cloth and set into draft free warm place to rise and double in size (about 1+ hour). Once the dough cycle is over and the dough is risen, punch down the dough. Pour couple tablespoons of oil onto your working surface and spread the oil all over with your hand. Remove the dough onto your working surface and bring all ends towards the center forming a ball. Then flip the dough ball tucked ends down, smooth surface up, and roll it into a log. Cut in 3 equal pieces. Shape each into a ball, and set it smooth side up to rest. Roll the dough ball as thin as you can into a circle. Lightly sprinkle the dough with about 3 tablespoons sugar. Cut the rolled out dough like a pizza into 10-12 pieces. Next, roll the crescents starting with the wider end and rolling towards the smaller end. Place shaped crescents onto parchment lined baking sheet, end side down, about 2-3 inches apart. Allow the crescents to rise for about 15-30 minutes until almost double in size. Brush with egg mixture. I love these! 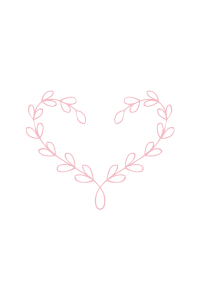 Made them so many times already but I have a question. 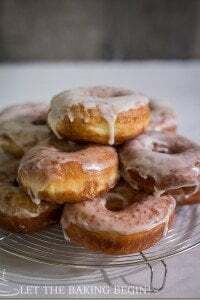 Have u ever had a problem with the sugar melting during the last rise or while baking and although they taste great they are sticky and sometimes get burned on the bottom. Any ways to avoid that? Thank you I love your recipes! Yum, these look so delicious. What kind of flour did you use? Thank you for including bread machine instructions. Just got a new one and I’m excited to make these this weekend!!! They look soooo good, may I ask you what kind of filing did you use for them.